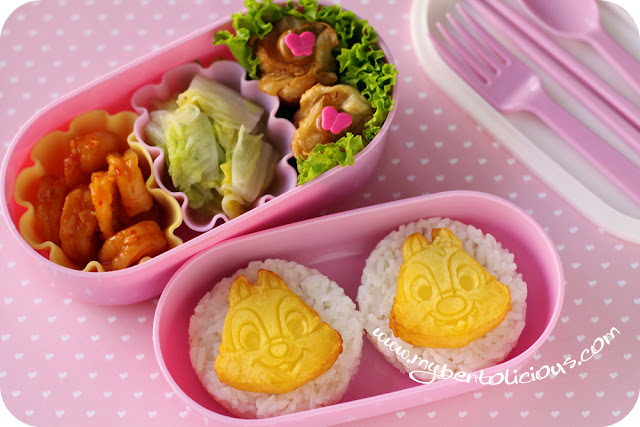 This bento only needs 15 minutes to arrange plus I still can managed to get the cute characters for today's bento. I used my Chip and Dale cookies cutter and round rice burger mold. It was no way to put cookies on the top of the rice, so what I did was cutting the potato with Chip and Dale cutters and then fried them. After that, when the potato was still hot, I pressed the top with the Chip and Dale stamps. Tada ... quick and easy. Inside the upper tier : fried potato on the top of the steam rice. Inside the bottom tier : prawns cooked with tomato & garlic sauce, Chinese cabbage & onion stir fry, and fried prawn shumai. That way to make the Chip and Dale is ingenius! Fry the potato and then stamp. It came out very nicely contrasted. I love the quick way to make it cute with no further detail needed. Love it! I wish I lived close to you so I could take a bento lesson from you. Brilliant idea to use your stamps on hot potatoes! Such a clever way to make Chip & Dale! Nice! So cute and perfect!!! 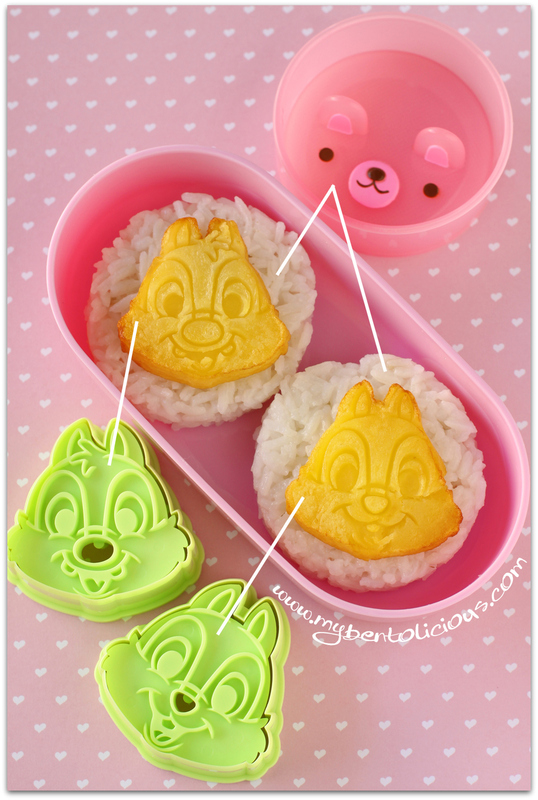 :) Beautiful bento Lia! @Susan Yuen : Thanks a lot Susan for your kind words! The idea is so clever! the chip n dale is so perfectly molded.. love it...a very very creative way!! Read u in inijie, impressed. You should start thinking making yr bento book. This is soooo cute! You're so talented! OH wow! It's sophisticated and cute at the same time! Loving this one Lia! You are so amazing. wow this looks so cute and sooo delicious!!! @Mrs. P : Thanks a lot Mrs. P! Great idea to use the potato..
What a great idea. You always have clever ways to make simple things look beautiful. Love it! @Jenny : Thanks a lot Jenny! the stamped potatos came out great - perfect chip and dale faces! your prawn and cabbage dishes in the top tier also look delicious - very sophisticated! Foto ini boleh saya pakai ngk untuk di OL shop saya?